The first Christmas after Jake and I got married, he bought me my own Christmas tree. I think it cost $15 at Big Lots (which was ridiculously cheap even 14 years ago). 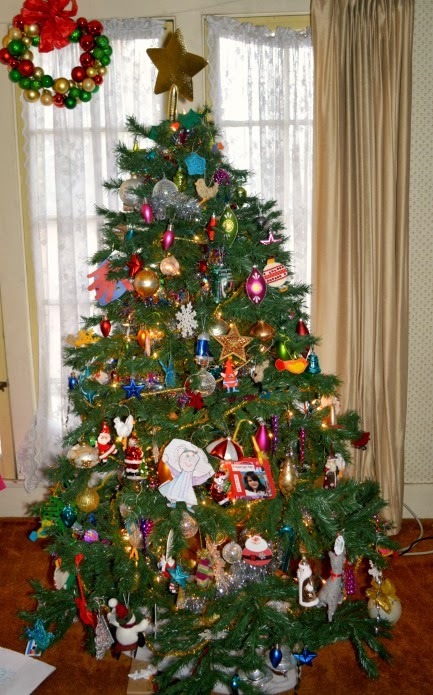 I had moved out of my parents house and straight into my grandma's house so that I could take care of her after she had her stroke, so for my whole life I'd never had an opportunity to decorate my own tree (Jake and I got married between when I moved in with my grandma and that Christmas, and he moved in with us too!). Back then I was a huge fan of fancy department store trees, perfectly coordinated and gorgeous, which was not the way that my family did Christmas. Our trees were a hodge-podge of family memories, ornaments my sister and I had made (like the paper plate angel on the top of the tree, courtesy of Sandy Sue), fun and funky ornaments my parents had made before we were born, ornaments from my grandma, nothing that matched, but all of it was filled with meaning. That was fine for them, but I wanted a PRETTY tree. A designer tree. Something out of a magazine. So Jake bought me a tree and I decorated it in gold and silver. It was gorgeous. But it was a little boring. The next year my grandma no longer wanted to put up her own tree, so Jake carried my fully decorated tree downstairs (I had set my tree up early. Like, pre-Thanksgiving early that year). I felt bad that she wasn't going to get to see any of her ornament collection, so I picked through her boxes and grabbed out a few of the vintage decorations to add to my tree. Wow, they perked the tree up, plus they made me happy looking at them, because they were my grandma's. And my grinch heart grew three sizes that day. 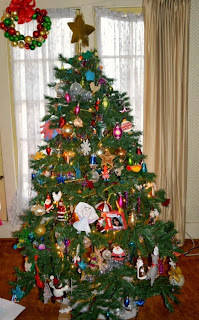 Now, 14 years later, my tree is a crazy hodge-podge of ornaments. Ornaments that Mims has made. Ornaments that I made before Mims was born. An impressive Santa ornament collection that my parents have given to Mims over the last 6 Christmases. The plastic $2 star on the top of the tree makes me smile because I bought it at Ikea after Mims and our dog, Kelsey, managed to pull the whole thing over on themselves 3 years ago. My beautiful designer star shattered, but my kid and my dog were okay, which was all I cared about. A few of those early ornaments have survived, but I tuck them deep into the branches of my tree. They're sparkly and pretty, but there's nothing special about them. The outside is reserved for bright colors and handmade, for the ornaments that mean something. And even though my tree isn't pretty enough to be on the cover of a magazine, I think it's beautiful. Did you know it's Saint Spoiling's Week? No? Well it is, and I'm spoiling you. Go get yourself some free books and have a happy day! I LOVE it! My tree is the same way! xoxoxo!!!! I love YOU!!! Have you downloaded my books yet? They're free right now, and one of them was dedicated to you... I was saving that as a surprise for when you finally got it, but it's been, like, a YEAR... LOL!! xoxoxo!! !